This week, we focused on Wide Boy Awake -- the short-lived project by former Adam & The Ants bassist Kevin Mooney. No retrospective mix necessary as we touched on all their singles ("Chicken Outlaw," "Slang Teacher," "Billy Hyena" and "Bona Venture.") If people are known by the company they keep, Wide Boy Awake will be remembered kindly as their songs appear on many compilations of the decade. We also played a demo of the new OMD song, "Sister Marie Says," and sample of "Ain't Gonna Die" from Bruce Kulick's upcoming album, BK3. What better way to hear what's coming to stores near you next year. Technically, we had a slight problem calling into the chat room and starting the show. For some reason the software dialpad wouldn't let us enter our passcode, making us start a little late. But otherwise, all went well. 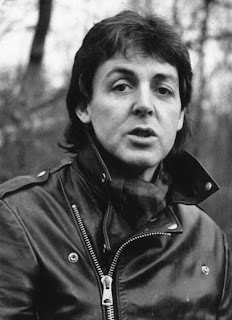 This time, we celebrated Paul McCartney week. The singer/songwriter released his new live CD/DVD, Good Evening New York City, this week and we gave away a copy of it during our show (with a trivia question.) We will also feature a retrospective mix and a few singles ("Take It Away," "No More Lonely Nights," "Press" and "Put It There") he released during the decade in an brief overview of his illustrious career. This week on Talking 80s Music, we decided to fill in another historical gap by explaining away any notion that Cyndi Lauper just appeared out of nowhere screaming "Girls Just Wanna Have Fun." Stardom is seldom sudden and often their early work to get to that level goes unnoticed. To fix this we showcased her short-lived band Blue Angel and exposing you to a rockabilly-ish side of one of the eighties most recognized artists. We featured their "I Had A Love," "Maybe He'll Know," "Take A Chance" and "I'm Gonna Be Strong." Their album is well worth purchasing. Had a great time working on this episode. There is something about reminding people of the music they should have heard and their radio stations are unlikely to play. We also played a sample of Slash's cover of "Paradise City" featuring Cypress Hill and Fergie as well as, "Amazing," the first single off Steevi Jaimz' latest album. Technically, all went pretty well. Had to amplify the mic towards the end of the show which added some static. Thinking that the playing of the songs is slowly knocking the mic level down but we'll mess with it later. This week we turn our eighties obsessed peepers on the solo career of Jane Wiedlin of the Go-Gos. Often overlooked, Wiedlin's voice is necessary voices in 80s music. We play a brief retrospective mini-mix, "Blue Kiss," "Inside A Dream" and "Whatever It Takes." We could have spent longer on her but we'll get to hear her more when we do a full episode on the Go-Gos. Nothing really technical to note. Tough week though. Dedicating this episode to the late Fred Sicks. Everything is going well otherwise and have a few interviews in the works. No, I'm holding it back until it's in the can and ready for your consumption.